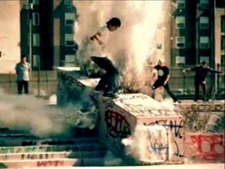 Slow motion skateboarding slams / bails / falls (1000 fps) is an unflinching look at when your feet betray you mid-skateboard trick. Directed by Adam Shomsky, maker of the equally riveting and much less painful WTF Flat Ground Tricks, this is a mesmerizing study in how bodies respond to slamming into concrete. If you think the skaters had enough time to course correct, make sure to watch the end of the video where everything is played at normal speed. Ouch.